Take 12 OREO cookies separate the top and bottom. Make sure each has some of the icing on it. Place the cookies into the cupcake liners with the icing up. Mix the cake mix, sour cream, oil, eggs, and vanilla in a large mixing bowl. 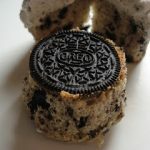 Crush remaining OREOs and use 1 1/2 cups of the crushed Oreos and fold these into the batter until well incorporated. Set aside the remaining crushed Oreos for the frosting. Scoop 1/3 cup batter into each lined cup­cake cup, filling it three-quarters of the way full. Bake the cupcakes until they are lightly golden and a toothpick inserted comes out with minimal to no crumbs, about 18 to 20 minutes. Remove cupcakes from the pan and cool on wire racks to cool before frosting.